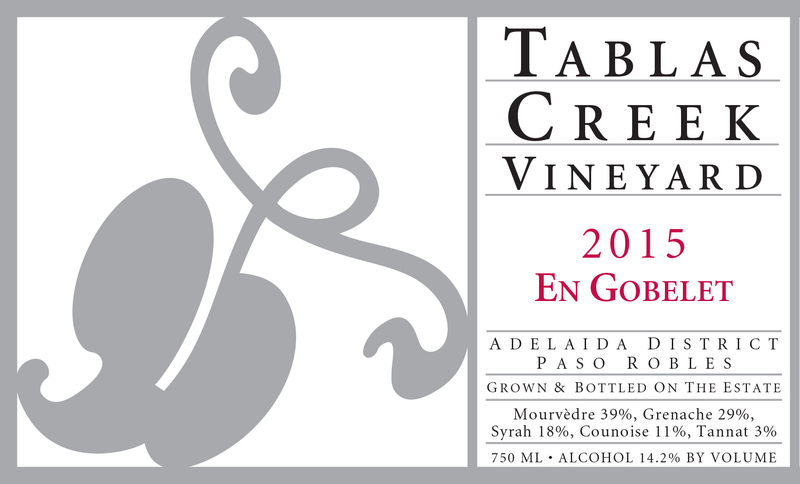 The Tablas Creek Vineyard 2015 En Gobelet is a unique blend of five estate-grown varietals, selected from head-trained, dry-farmed sections of our certified organic estate vineyard. We have felt for some time that the lots from head-pruned blocks share an elegance and a clarity that was noteworthy. Beginning in 2007, we created our non-traditional blend En Gobelet which combines the fruit, approachability and lushness of Grenache, the structure, earth, and mid-palate richness of Mourvèdre, the dark color and minerality of Syrah, the vibrant spiciness of Counoise, and the dark smokiness of Tannat. The 2015 En Gobelet has a dark, spicy nose, marked by Syrah (or perhaps the cool vintage): black cherry, crushed rock, and meat. The palate is vibrant: more cherry, roasted herbs, rare steak, and both the flavor and texture of baker's chocolate. The long finish shows more mineral, and a smoky fire-grilled meat dripping character that we imagine will only get more pronounced with time in bottle. The 2015 vintage saw dramatically reduced yields from the combined effects of four years of drought and cool, unsettled weather during May's flowering. Months alternated between significantly cooler than normal and significantly warmer than normal, which produced an early start to harvest but required multiple passes through most vineyard blocks during a long, drawn-out picking season. Yields were down as much as 50% in early-ripening grapes like Grenache and Syrah, but later grapes like Mourvedre were only down slightly. The result was a vintage with excellent concentration but unusually good acids, and wines with dramatic perfume, texture, and intensity. Our Syrah harvest began September 9th, followed by Grenache on September 10th, Mourvedre on September 24th, Counoise on September 26th and Tannat on September 29th. The last pick from our dry-farmed blocks was on October 10th. The grapes were largely havested from the section of the vineyard we call "Scruffy Hill" and fermented individually in small fermenters using native yeasts. After pressing, the wines were moved into a mix of neutral oak barrels and puncheons before being selected and blended in May 2016. The finished wine was aged in one 1200-gallon French oak foudre as well as a couple of older oak puncheons before being re-blended and bottled in April 2017.